Craving chocolate? You MUST make my homemade chocolate pie. Fluffy, with a rich chocolate flavor; topped with whipped cream. Or how about a gooey chocolate caramel pie, or a homemade snickers pie? More homemade pie recipes at the end of the page. To make the crust, combine the crushed cookies and melted butter together in a bowl and mix well. Spray the pie plate with vegetable oil and using your fingers, press mixture into the bottom of your pie plate. Bake for 5 minutes and cool completely before filling. Combine the chocolate, vanilla and salt in a blender or food processor. In a saucepan add 1 cup of the heavy whipping cream; bring to a slow boil. SLOWLY add the processed chocolate mixture and marshmallows; whisking until it is melted and smooth. Pour this in a large bowl and cool to room temperature. Beat 2 cups of the heavy whipping cream and sugar in a bowl until it forms high peaks. Fold this into the cooled chocolate mixture. Chill for a minimum of 6 hours; overnight is best. Before serving, beat the remaining 3/4 cup of cream until it forms high peaks. Spoon over the pie and swirl with a tablespoon to decorate or use a straight knife to smooth the top of the whipped cream layer. Garnish with chocolate sauce drizzled on the plate, shaved chocolate on top and fresh raspberries. 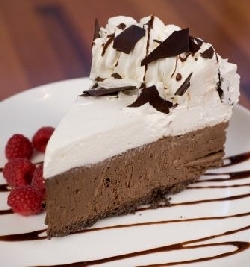 This is homemade chocolate pie is heaven on a fork, trust me. Mix the butter and the graham cracker crumbs together and press into 9 inch baking pan. Bake for 10 minutes and cool on a wire rack. In a double saucepan, melt the caramels and caramel sauce together. Add 1/2 cup heavy whipping cream and whisk together. Remove from heat and add the nuts. Pour into the graham cracker crust and chill for at least one hour. Before serving, melt the chocolate, remove from heat and add the remaining 1/4 cup heavy whipping cream. Drizzle mixture over dessert and try not to devour the whole thing yet. Chill for 1 to 2 hours and dig in. **You may also use chocolate wafer crumbs for this homemade chocolate pie. This pie is absolutely scrumptious and is very rich. Beat the cream cheese, powdered sugar and peanut butter together until creamy. Add half of the chopped candy bars and fold in the whipped cream. Top with remaining candy bars and peanuts. Drizzle with caramel and chill overnight before serving.